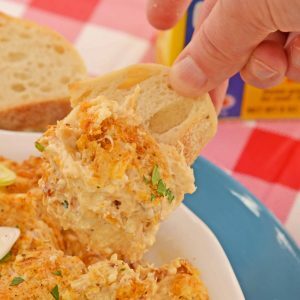 Hot Crab Dip with cream cheese is a is a Maryland classic! Blended with cheese, lump crab meat and old bay, this crab dip served hot is the best party appetizer recipe! Preheat oven to 350 degrees. Coat a shallow baking dish or pie plate with cooking spray. In a large mixing bowl or the bowl of a stand mixer fitted with the paddle attachment, cream together softened cream cheese and mayonnaise. Add worcestershire sauce, hot sauce, Old Bay and white pepper, blending well. By hand, fold in shredded sharp cheddar cheese and crab meat, being mindful to try and keep crab meat morsels whole. Transfer mixture to baking dish. Bake uncovered for 10 minutes. Top with scallions and serve with crackers, bread slices or vegetables like carrot sticks and celery.